“We knew, yes, we were deprived,” he later recalled. “It wasn’t the same thing for white kids, but it was as full a life as you could make it. I mean, we made toys for ourselves with wires, making cars, and you really were exploding with joy! I recall one day when I was out walking with my mother when a white man, a priest named Trevor Huddleston, tipped his hat to her—the first time I ever saw a white man pay this respect to a black woman. The incident made a profound impression on me, teaching me that I need not accept discrimination and that religion could be a powerful tool for advocating racial equality”. Because of how dire things were, he nearly died of Tuberculosis at a young age. When Tutu was 12, he contracted a deadly cough known as tuberculosis which nearly took his life. He spent about two years in the hospital before he recovered. This happened around the time his family moved to the capital city of South Africa, Johannesburg. This disease led to his initial ambition of becoming a medical doctor. While Desmond suffered from tuberculosis, he was inspired by the sickness to become a medical doctor so as to find a cure for the deadly disease. Unfortunately, after gaining an admission into a medical school, he couldn’t make it because his parent could not afford the fees. As an alternative, he went to study education at Pretoria Bantu Normal College, where he was given a scholarship. Desmond attended Johannesburg Bantu High School, a grossly underfunded all-black school where despite all odds, through the positivity and encouragement of their black teachers he still received an excellent education. He graduated from high school in 1950 and went on to do a teacher training at the Pretoria Bantu Normal College. He graduated from the Pretoria Bantu Normal College with a Teacher’s Certificate in 1953. After this, he enrolled at the South Africa University and graduated with a Bachelors Degree in 1954. After the passing of the Bantu Education Act, he resigned his post as a teacher in 1957. He then attended St. Peter’s Theological College in Johannesburg and was ordained an Anglican priest in 1961. In 1962 he moved to London, where in 1966 he obtained an M.A. from King’s College London. From 1972 to 1975, he served as an associate director for the World Council of Churches. He was appointed Dean of St. Mary’s Cathedral in Johannesburg in 1975, the first black South African to hold that position. In 1985, he became the first Johannesburg’s black Anglican Bishop. Subsequently, in 1986, he became the first black Archbishop of Cape Town and Bishop of the Church of the Province of Southern Africa (now the Anglican Church of Southern Africa. From 1976 to 1978, he served as Bishop of Lesotho. In 1978, Desmond Tutu was appointed General Secretary of the South African Council of Churches (also the first black to hold the position), and became a leading spokesperson for the rights of black South Africans. 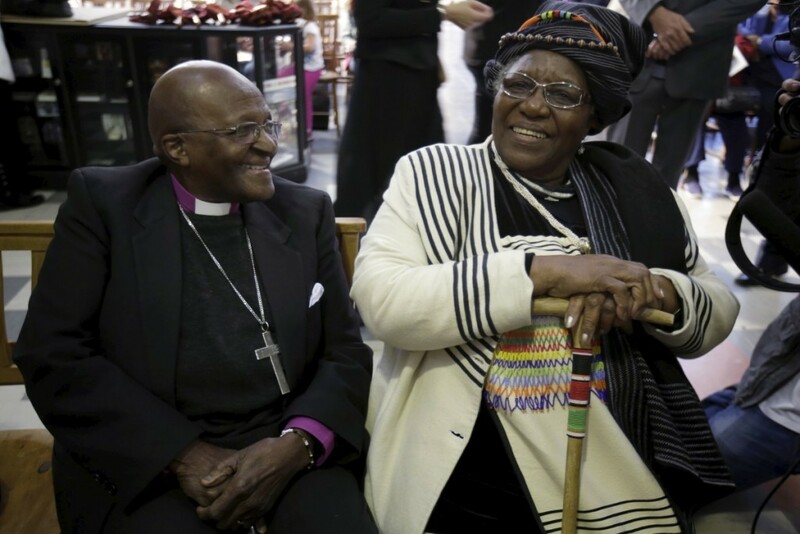 Tutu retired from the primacy in 1996 and became Archbishop Emeritus, and in his 79th birthday in 2010, he announced his intention to effectively withdraw from public life. However, he said he’ll continue to work with the “Elders”, a group of international leaders he co-founded in 2007 for the promotion of conflict resolution and problem-solving throughout the world. Desmond Tutu married Nomalizo Leah Shenxane in 1955, a teacher whom he had met while at college. They had four children: Trevor Thamsanqa, Theresa Thandeka, Naomi Nontombi and Mpho Andrea Tutu. In 1976, the protests in Soweto, also known as the Soweto Riots, against the government’s use of Afrikaans as the compulsory language of instruction in black schools became an uprising against apartheid. From then on Tutu supported an economic boycott of his country. He vigorously opposed the “constructive engagement” policy of the Reagan administration in the United States, which advocated “friendly persuasion”. Tutu rather supported disinvestment, although it hit the poor hardest; for if disinvestment threw blacks out of work, Tutu argued, at least they would be suffering “with a purpose”. Tutu pressed the advantage and organised peaceful marches which brought 30,000 people onto the streets of Cape Town. Tutu was a South African Civil Rights leader. He worked assiduously to end South Africa’s strict racial segregation policy, known as apartheid. He set forward these following points: the abolition of South Africa’s passport laws, a common system of education, the cessation of forced deportation from South Africa to the so-called “homelands” and equal rights. He also fought against the racial discrimination by constantly preaching reconciliation between different parties associated with apartheid, through his writings and lectures at home and abroad. In 1994, Nelson Mandela appointed him the chairperson of Truth & Reconciliation Commission (TRC), where he led the Commission to gather evidence of apartheid-era crimes for the past 34 years. 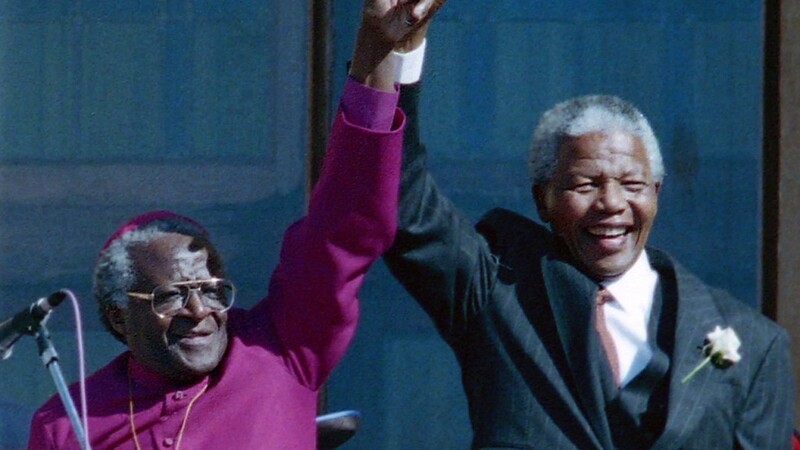 The credit for the term, “Rainbow Nation” is always given to Desmond Tutu because of the tremendous role he played in creating a new Apartheid-free South African society. He founded the Tutu Foundation for Development and Relief and The Desmond Tutu HIV Foundation. Solomon Islands – Establishment of the Truth and Reconciliation Commission. China – the release of dissident Yang Jianli in 2007 and fight against violence. He received the Nobel Peace Prize in 1984 (the second South African to receive the Award); the Albert Schweitzer Prize for Humanitarianism in 1986; the Pacem in Terris Award in 1987; the Sydney Peace Prize in 1999; the Gandhi Peace Prize in 2007; the Presidential Medal of Freedom in 2009; U.S. Presidential Medal of Freedom(2009); an award from the Mo Ibrahim Foundation that recognized his lifelong commitment to “speaking truth to power” (2012), and the Templeton Prize (2013). 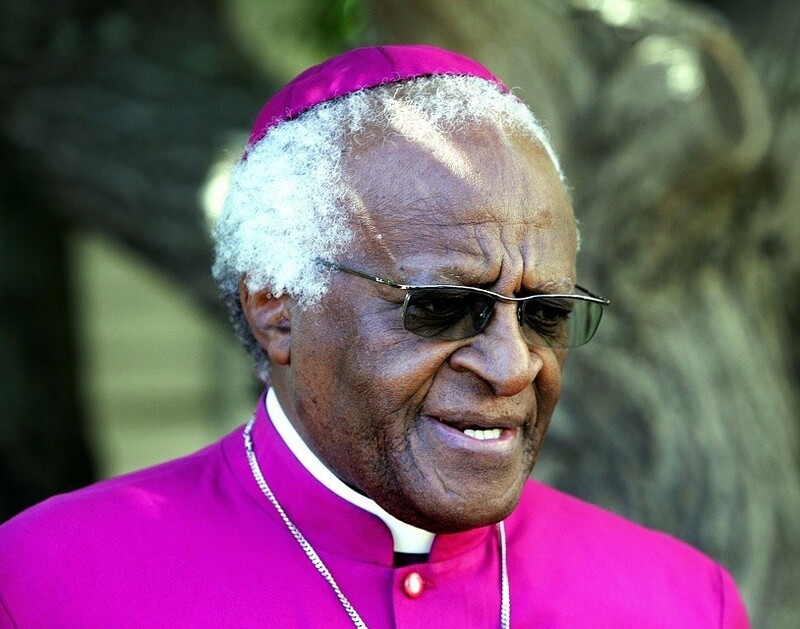 Tutu is also a holder of a number of honorary degrees, earned from prestigious universities across the world. He was diagnosed of prostate cancer in 1997 which he is still managing till today. Consequently, he became the patron of South African Prostate Cancer Foundation, which was established in 2007. A collection of personal reflections; and Made for Goodness: And Why This Makes All the Difference (2010), reflections on his beliefs about human nature.